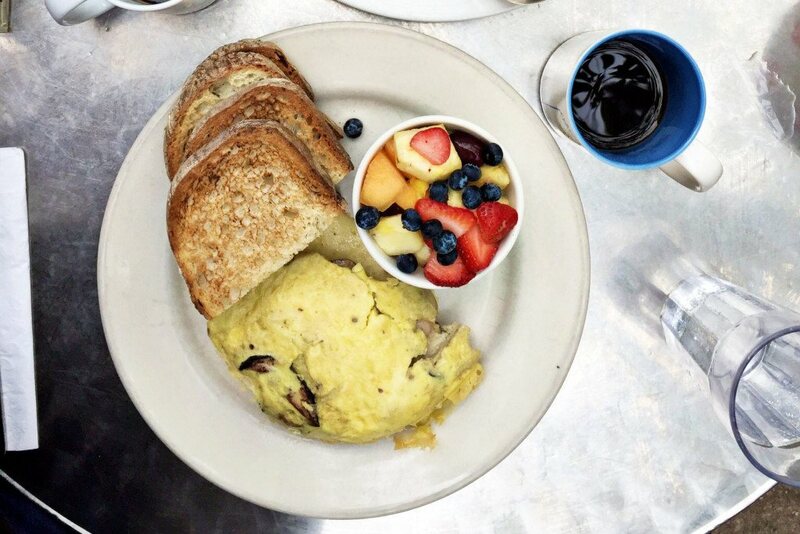 The Bella Visa omelette — paired with fruit and grain-filled toast — makes the list of healthy Sabrina’s Café orders. Photograph by Caroline Cunningham. If you’ve lived in Philly, you’ve probably hit up Sabrina’s Café for brunch on more than one occasion. For one thing, it’s delicious — for another, the portion sizes are out of this world. But speaking of portion sizes, if you’re looking to eat healthy during your next brunch outing, super-sized stuffed French toast might not exactly make the cut. That said, finding healthy Sabrina’s Café menu items is totally doable. While the restaurant’s five locations serve dinner as well, we’re focused on the breakfast and brunch options here, because honestly, that’s what we think of when we think of Sabrina’s. Check out the menu ahead of time! If you haven’t planned out your meal, your going to be so much more likely to fall for the seasonal specials (Pumpkin Maple Brown Sugar French Toast on brioche, I’m looking at you). While it is totally fine to make an indulgent choice if that is what your intention is, if you want to stick with a healthy choice, you’re better off planning ahead. Ask for toppings on the side. Oatmeal sounds like a super healthy choice, however, once it is loaded with caramelized fruit, candied nuts, and maple syrup, it can turn into a high-sugar and calorie-laden dish. If you ask for the toppings on the side, you can adjust the amounts yourself, and use as much as you need for flavor. Make some substitutions. The veggie omelette might be a sensible choice, but once you’ve added the home fries and a couple of pieces of buttered toast, the meal is less healthy. Go with fruit or a side salad instead of the home fries, and choose the whole wheat or multi grain bread. Now, on to the best healthy Sabrina’s Café menu items! There are plenty of healthy egg options at Sabrina’s! Eggs are always a great protein source, while also providing choline, an essential nutrient active in the synthesis of brain chemicals. Here are my three healthy egg favorites. Egg White Turkey Bacon Frittata: The turkey bacon is significantly lower in saturated fat and sodium than regular bacon, and you’re getting some veggies as well (spinach and tomatoes). The frittata and two slices of multigrain bread delivers 780 calories, a hefty 73 grams of protein and 74 grams of carb, without the home fries. Perfect after a Sunday morning road race! The Quinoa Bowl: It’s packed with fiber from the quinoa, roasted veggies, and black beans. Fiber is important to make those gut bacteria happy, and prevent constipation (we dietitians always talk about that stuff). Avocado gives you healthy, unsaturated fat, and you’re getting your protein from the two eggs. Bella Vista Omelette: Make your own omelette with plenty of veggies added. I’d go for the spinach, tri-bell peppers, and mushrooms, and add a little feta cheese as well. Mushrooms provide plenty of important minerals, such as copper, zinc, and selenium. The Philly: This dish is likely a high-calorie, high-saturated-fat and high-sodium item due to in part the yellow cheese sauce and pork scrapple. The buttered potato roll and fried peppers don’t help the dish either. The B-B-B-Bene & the Tests: This dish has poached eggs and spinach, and an English muffin is a great serving size for bread. So why does this belong on my worst list? Hollandaise sauce is to a large extent melted butter (and egg yolks) and therefore very high in fat. Make this dish healthier by asking for the sauce on the side, and add just as much as you need to be satisfied. The Tots: This signature dish is made with fried panko-encrusted tater tots and a hot sausage hash, both high fat and sodium items, as well as topped with sour cream. Short Stack of Whole Wheat Pancakes: Opt for these grain-filled cakes with berries on the side. Whole wheat pancakes are higher in fiber and nutrients than regular buttermilk pancakes. If you feel like you won’t be full enough from the short stack of pancakes, add two scrambled eggs for protein. Stuffed Challah French Toast: Let’s face it, we all know that the oversized portion of cream cheese Stuffed Challah French Toast topped with bananas and vanilla bean syrup is going to be very high in calories and sugar. My best advice: Go with a couple of friends, and share one for the table! House Made Granola: Granola typically has a “healthy halo” — it often sounds healthier than it is. Granola is usually high in sugar, and is served in large portions at restaurants. You may be better off with those pancakes, after all! Tofu Scramble: This dish comes with spiced tofu and plenty of sautéed veggies (onions, bell peppers, spinach, mushrooms, garlic, and shallots). Vegan Backpack: This option has multigrain toast with white bean hummus, avocado, and olive tapenade for plenty of fiber and flavor! Amy von Sydow Green, MD, MS, RD, is a Philadelphia-based dietitian/nutritionist with a passion for healthy nutrition, cooking, food trends, and developing new recipes. Learn more about her work here.